It’s probably become a cliché but it has been said countless times: People who can afford a (insert luxury brand) don’t worry about what they’ll spend on gas. The assumption is they’ve got money to burn—or, more to the point, internally combust—so fuel economy is no big deal to them. Whether that’s true or not about their customers, the makers of such cars have become concerned with how much eau de dinosaur their products consume. They have to, what with corporate-average fuel economy standards and the like. That’s why we have things like 4-cylinder BMW 5-Series sedans. Though the 5-Series sedan has been completely redesigned for 2017, its styling is only subtly changed from the previous-generation model. Nineteen-inch alloy wheels are a $600 option. 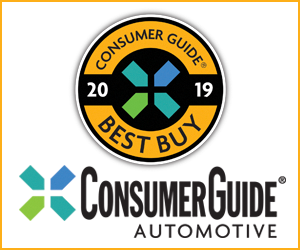 The BMW 530i with xDrive all-wheel drive tested by Consumer Guide® was motivated by a new 2.0-liter turbocharged four joined to an 8-speed automatic transmission. There’s a standard stop/start feature to shut off the engine at full stops for traffic signals and other delays, and an “ECO PRO” setting among the choices in the selectable “Driving Dynamics Control” menu. For good measure, BMW has lightened the all-new seventh-generation 5-Series—by as much as 137 pounds depending on the model. With all that working for it, the 530i xDrive’s EPA mileage estimates are 22 mpg in city driving, a gain of one over the 2.0-liter in the former 528i; 33 mpg in highway driving; and 26 combined. This reviewer’s 185-mile turn in the test car averaged a not-too-bad 24.2 mpg with 60 percent of the distance covered under city-type conditions. The 5-Series cabin is beautifully finished, especially when enhanced by options such as Ivory White Nappa Leather ($1000), and Grey Poplar Wood Trim (no cost). The optional Ceramic Controls ($650) replace the iDrive control knob and other controls with real black-glazed ceramic pieces instead of plastic. The trick is trying to achieve this while still providing enough power to make the 530i feel like a premium midsize sedan ought to feel. Outfitted with direct injection and a twin-scroll turbo, the engine churns out 248 horsepower at 5200 rpm—a gain of eight horsepower over the 528i’s powerplant—and 258 lb-ft of torque at just 1450 revs. 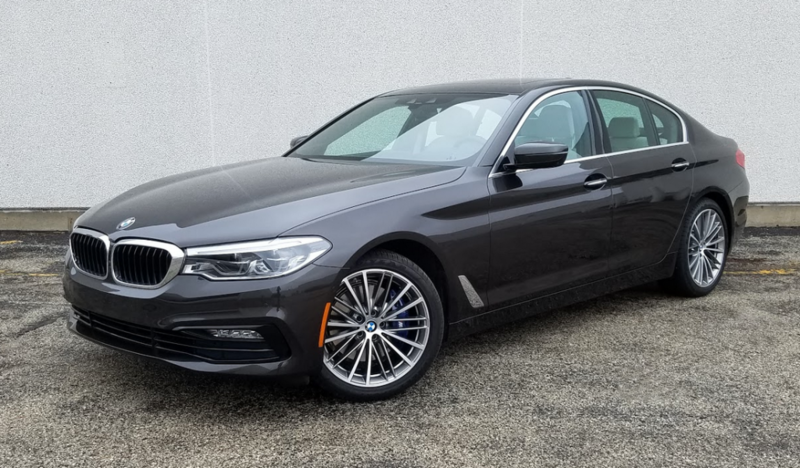 With xDrive, BMW cites a 0-60-mph time of 5.8 seconds, which is 1.1 seconds slower than the 335-horsepower 6-cylinder 540i xDrive makes the same sprint. The engine is fairly quiet, delivers decent power just about all of the time, and isn’t hampered by appreciable turbo lag. Still, this driver has piloted plenty of BMWs that felt stronger and quicker when the 5-Series boasted nothing less than fine inline sixes. At least the evolving philosophy about engines hasn’t changed 5’s excellent reputation for ride and handling, which CG’s test car clearly demonstrated. 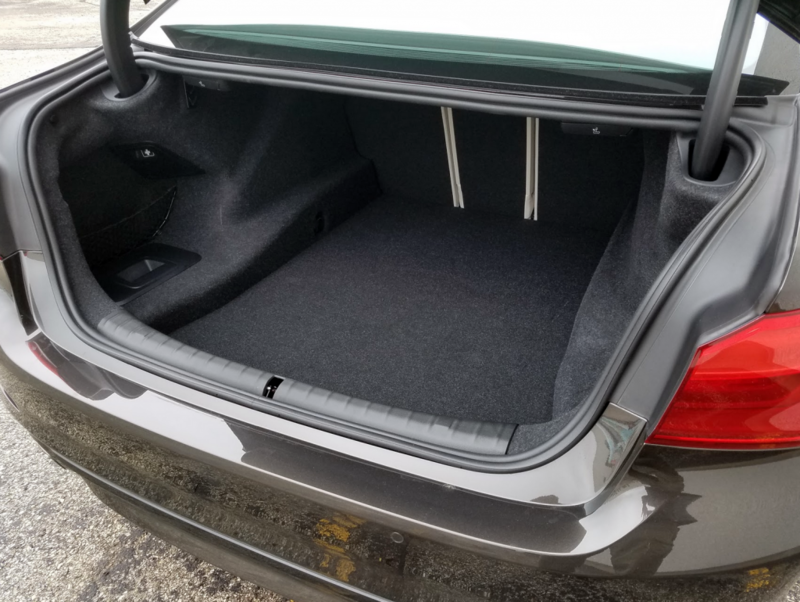 The trunk can be more easily accessed via the available power decklid ($500). 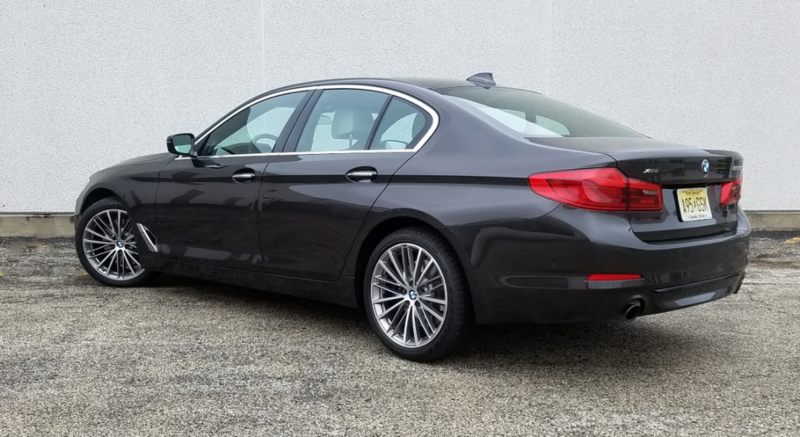 Even if, as the stereotype contends, 5-Series buyers aren’t particularly concerned about cost, the money they are saving on gas with a 530i can readily be spent on other things. The xDrive version, which starts at $53,500, is $2300 costlier than a rear-wheel-drive 530. 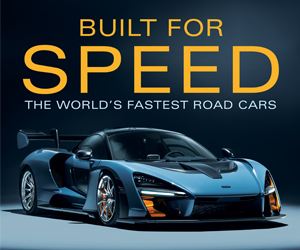 In fact, the CG sample car soared to $72,735 with options and delivery. The laudable driving dynamics benefitted from Dynamic Damper Control, Integral Active Steering (with rear wheels that turn in the same direction as the front wheels at higher speeds), and uprated M Sport brakes—items that cost from $650 to $1150 to add. Beyond that, the test car was crammed with option packages that actually deliver some of the things you might expect to be included in a luxury car. Do you want heated seats and steering wheel? There’s a Cold Weather Package for that. A rearview camera comes in the Driving Assistance Package; blind-spot, lane-departure, and rear cross-traffic alerts require the Driving Assistance Plus group. Automatic high-beam-headlight control is included in the Lighting Package. A Wi-Fi hotspot and satellite radio are among the items in the Premium Package. Nappa leather in place of the standard “SensaTec” material on the seats runs $1000. Owners have to pony up for power trunklid or Apple CarPlay smartphone compatibility. If you’d prefer a paint color other than white or black—say the Jatoba Brown Metallic that was on CG’s car—you’ll need to open your wallet. There’s still plenty more available, too, as our itemized list of test-car options shows. Standard on the new 530i are adaptive LED headlights, 18-inch wheels, moonroof, BMW apps and remote services, comfortable front sport seats with 16-way adjustment and memory settings, BMW’s Fatigue and Focus Alert system, automatic climate control, navigation, and a 10.2-inch touchscreen. Also included, for better or for worse, is the iDrive 6.0 that governs things like navigation and audio from a central controller on the console. It puts everything at your fingertips—if you fiddle with it long enough. Voice commands can be used to direct some of this. A quick test found it had no problem summoning requested AM, FM, and satellite radio stations, and users might be a little surprised to be answered by a voice that’s more BBC and not smartphone lady. Casual BMW fans might assume that the 530i is powered by a 3.0-liter engine, but BMW naming convention is no longer that straightforward. The 2017 530i comes with a turbocharged 2.0-liter 4-cylinder engine rated at 248 horsepower. Passenger room is very good in front. Rear leg room is pretty good as well, although an adult sitting behind a driver six feet or more tall might test the limits of that room. The realistic adult limit to rear-seat occupancy is two—a tall driveline hump and close encounter with the headliner see to that. Otherwise, headroom is generous and all-around vision is quite good. Soft-touch material seems to be everywhere, even on the sides of the wood-trimmed console, and door map pockets have a soft lining. The high-style dash design requires a low-lying glove box that’s difficult to access. The console box (under a padded split top) with power point and USB port isn’t exactly capacious, and the door pockets are small but they do incorporate bottle holders. Hinged pouches are attached to the backs of the front seats. Cup holders are hidden under a door in the console and pop out of the pull-down center armrest in the rear. Trunk space is narrow between the wheelhouses, and the floor rests lower down the center than it does in the rear corners. Rear 40/20/40 seats fold nearly flat at a very slight rise above the level of the trunk floor. 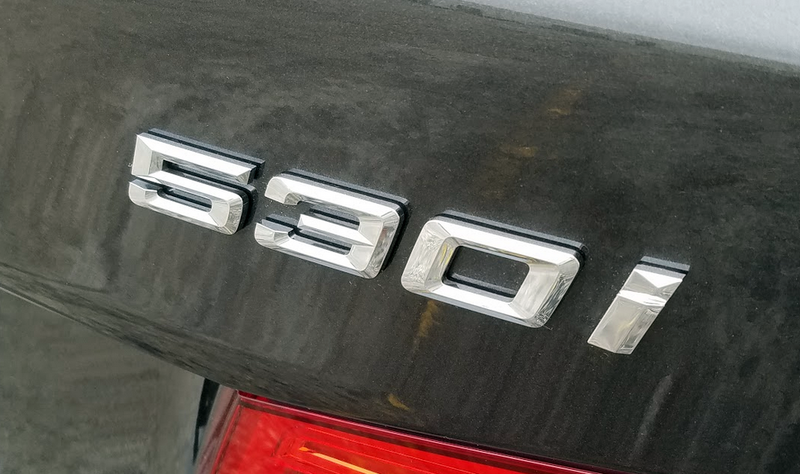 With its attention to better fuel economy, the 530i is a more affordable 5-Series—if you can afford one. Though slightly longer than the previous generation, the 2017 5-Series is almost 140 pounds lighter than its predecessor. Written by: The Daily Drive staff on April 19, 2017.on February 1, 2018.